One of the most attractive American atlas maps of Washington D.C. to appear in the mid-19th century. This is beautiful hand colored 1850 map of Washington D.C., Capital of the United States. 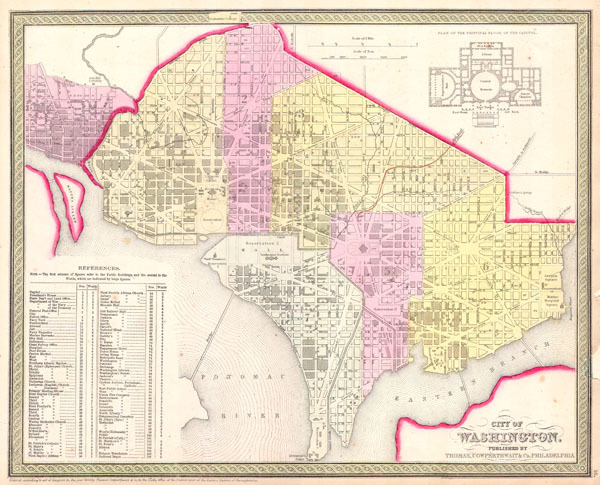 The map covers all of Washington D.C. as well as parts of adjacent Georgetown. The whole is highly detailed with individual buildings noted and color coding to define city wards. Some seventy-five buildings, including the Capitol, the White House, the Cemetery, the Brewery, various markets, the Masonic Hall, and the Tobacco Warehouse, and many others, are identified. Produced by the American map publisher S. A. Mitchell Sr. from his offices on the northeast corner of Market and 7th Street, Philadelphia, Pennsylvania. Very good condition. Blank on verso. Minor toning in the lower left quadrant - see image. A few marginal verso repairs of closed tears. Else a clean example. Rumsey 0537.017 (1846 edition). Phillips (Atlases) 6103-16.